When Terance Gamble was pulled over by police in Alabama three years ago for having a faulty headlight, he probably didn’t think that prosecutors would make a federal case out of it. And he certainly wouldn’t have imagined that his case would make national headlines – not so much for its own sake, but because of what a win for Gamble might mean for prosecutions arising from Special Counsel Robert Mueller’s investigation into possible Russian interference in the 2016 election. 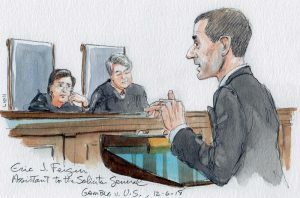 Both of these things did happen, but after nearly 80 minutes of oral argument this morning, Gamble seemed unlikely to prevail on his argument that the federal charges against him violate the Constitution’s double jeopardy clause, which would in turn preserve the ability of state prosecutors to bring charges against defendants in the Mueller investigation even if they receive pardons from President Donald Trump for any federal charges brought against them. When the police officer who had stopped Gamble searched Gamble’s car, he found two bags of marijuana, a digital scale and a handgun. Gamble was charged with violating state drug laws, but he was also charged under both state and federal laws with being a felon in possession of a firearm. After he was sentenced to one year in state prison, Gamble argued that prosecuting him on the federal firearm charge would violate the Constitution’s double jeopardy clause, which guarantees that no one shall “be twice put in jeopardy” “for the same offence.” The lower courts rejected that claim, relying on what is known as the “separate sovereigns” doctrine – the idea, based on longstanding Supreme Court rulings, that state and federal governments are two different sovereigns and therefore can both prosecute someone for the same conduct without infringing on the double jeopardy clause. Gamble then went to the Supreme Court, which agreed to weigh in earlier this year. Its decision to grant review means that there were at least four votes to take up the case, but after today’s argument it is hard to see how Gamble could get five votes to overturn the separate sovereigns doctrine. Arguing for Gamble, lawyer Louis Chaiten began by telling the court that the separate sovereigns doctrine is inconsistent with the text and original meaning of the double jeopardy clause, and he pointed to what he described as a “mountain of affirmative evidence” that, in the years before the drafting of the U.S. Constitution, courts in England would not have allowed successive prosecutions. Chief Justice John Roberts was skeptical, observing that Chaiten’s leading authority for his assertion that courts in England would not have allowed successive prosecutions involved a bar on prosecutions in England after an earlier prosecution overseas. It would be “surprising,” Roberts suggested, for the new American republic to want to adopt the same rule because it would have been a significant intrusion on the fledgling country’s sovereignty. Even more broadly, other justices were concerned that adopting Gamble’s rule would bar the federal government from prosecuting defendants who injure American citizens overseas. Justice Samuel Alito asked Chaiten about a hypothetical case in which terrorists who murdered American tourists in a foreign country are tried but acquitted there. Does that mean, Alito asked, that the terrorists can’t be prosecuted in the United States for murder? 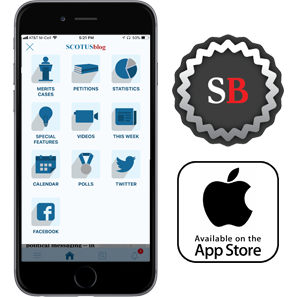 Chaiten told Alito that in a case like that the U.S. court would have to decide whether to recognize the foreign court, but he assured Alito that such an inquiry was not necessary in Gamble’s case, which involves courts in Alabama. Justice Brett Kavanaugh pushed back, though, telling Chaiten that the Supreme Court needs to consider this question because Gamble’s position would necessarily extend to foreign prosecutions and could hamper national-security efforts. Justice Elena Kagan also chimed in, emphasizing that Gamble is asking the court to write an opinion based on the Framers’ original understanding of the double jeopardy clause. If that original understanding reflects how England would have dealt with foreign prosecutions, she suggested, the court’s opinion would apply to foreign prosecutions as well. 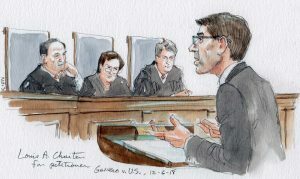 Justice Stephen Breyer voiced a related concern: the possibility that a ban on successive prosecutions would harm the federal government’s ability to prosecute federal civil-rights cases and domestic violence among Indian tribes. By contrast, he asked Chaiten, is it really the case that as a practical matter, people are prosecuted twice for the same thing? 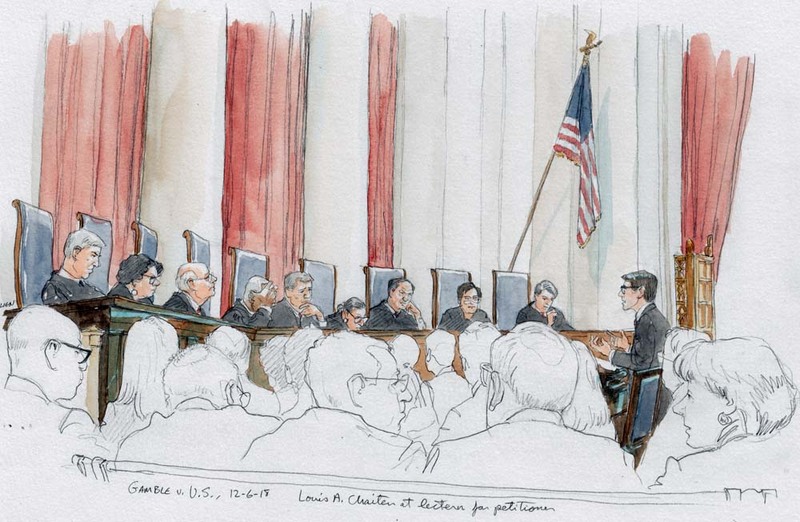 Some justices also voiced qualms about overturning the doctrine, pointing to the principle – known as stare decisis – of adhering to prior decisions. Kagan was the first to raise this issue, noting that the separate sovereigns doctrine is a “170-year-old rule” for which 30 justices have voted. Stare decisis, she stressed, is at bottom a doctrine of “humility”; we don’t want to overrule an earlier decision or rule just because we think we can do it better. But Gorsuch later seemed to side with Justice Ruth Bader Ginsburg (who had previously suggested that the Supreme Court should reconsider the separate sovereigns doctrine) and against the government, as both justices peppered Eric Feigin, the assistant to the U.S. solicitor general who argued on behalf of the United States, with questions about federalism – the concept of dividing power between the federal and state governments. I can’t think of another case, Gorsuch mused, in which federalism is used to justify more intrusions by the government into people’s lives (here, the prospect of dual prosecutions), rather than to protect people against intrusions. 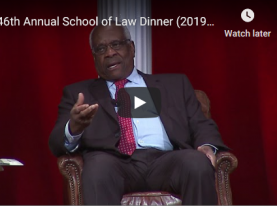 Justice Clarence Thomas did not ask any questions, but he joined Ginsburg’s opinion calling for a “fresh examination” of the separate sovereigns doctrine, so Gamble likely has at least three votes in his favor. Finding two more votes to overrule the doctrine, though, seems like a tall order. A decision is expected sometime next year.